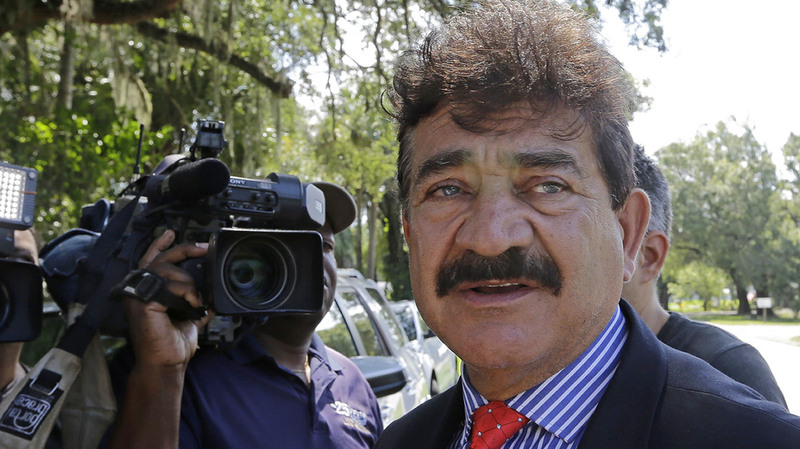 Orlando Nightclub Shooter's Father Was FBI Informant, His Widow's Lawyers Say : The Two-Way A federal judge denied the defense team's motion for a mistrial Monday. Noor Salman's lawyers had that argued prosecutors withheld key details, including Seddique Mateen's past connections to the FBI. Seddique Mir Mateen, father of Omar Mateen, speaks with reporters in Fort Pierce, Fla., in 2016. Seddique Mateen, the father of the man behind the 2016 Pulse nightclub massacre, worked with the FBI as a confidential informant for more than a decade leading right up to the shooting, according to attorneys for the shooter's widow. The defense team revealed the information in a motion filed just hours before calling their first witness on behalf of Noor Salman, who stands accused of aiding her husband, Omar Mateen, and obstructing state and local investigations. The attorneys argued that the case should be dismissed or declared a mistrial because prosecutors waited until Saturday — days after prosecution rested its case and nearly two weeks after the trial began — to acknowledge the shared history between Seddique Mateen and federal law enforcement. U.S. District Judge Paul Byron denied that motion later Monday. In the disclosure emailed to the defense Saturday, prosecutor Sara Sweeney said Mateen served as an informant "at various points" between January 2005 and June 2016. The note also revealed that the FBI launched an investigation of the elder Mateen after finding evidence he made money transfers to Turkey and Afghanistan in the months leading up to the shooting. These previous omissions "have placed Ms. Salman, the jury, and this Court in a dark wood where the search for truth has been thwarted," the motion states. "It is apparent from the Government's belated disclosure that Ms. Salman has been defending a case without a complete set of facts and evidence that the Government was required to disclose." Defense attorneys argued that this evidence — which they say must be disclosed if it could impact the case, citing legal precedent — would have substantially changed their arguments in court. Specifically, they questioned whether the father had foreknowledge of Omar Mateen's attack and whether he "played a significant role" in the FBI's decisions to drop its investigations of his son in 2013 and 2014. Immediately after the June 2016 massacre, which left Omar Mateen and his 49 victims dead at the club, Seddique Mateen condemned his son's actions on multiple media outlets. "I apologize for what my son did. I don't know why he did it," he told NBC News at the time. "He is dead, so I can't ask him. I wish I knew." The defense's case proceeded in the courtroom Monday as several witnesses took the stand. They argue that Salman, the sole person charged in connection with her dead husband's rampage, was a "simple woman" with a low IQ, easily influenced and badly abused by Omar Mateen — and, they assert, utterly ignorant of his violent designs on the club. Closing arguments are expected later this week.